Earlier today Carol & I witnessed a man's death – mostly likely due to a heart attack. I present below a post from 2014 that was approved by an Emergency Room doctor in the event you experience such an emergency. The paramedics on the scene today used much of the techniques described in the post. Today's experience is a tragic reminder to review this post ever so often just in case you could help. Click here to watch Yale students sign a petition that does away with their right to sign a petition. On January 20, 2016, during the noontime hour, we will have exactly one year remaining in BO's presidency – seven down one to go. I bring up the hour because BO has made it clear that his purposeful onslaught against America will continue until the very minute that his term expires. The American Republic was founded on a strong bedrock foundation – otherwise it would not have withstood the anti-American programs that BO has dished out. In the most likely event that BO is succeeded by another Democrat (announced or unannounced) the Republic's durability & longevity will be tested even further. I thought it constructive to list below BO's harmful & destructive policies during the last seven years that readily come to mind in case any readers had forgotten & wanted to help in their own way make sure these policies were not continued in 2017 – please let me know of any glaring omissions to the list you think of or any policies that BO has implemented that would have actually helped America. I did not include any normal partisan policies that any president would use but rather the obvious ones that show the deliberate destructive intent of BO's policies. In summary, BO is a master of the Alinsky Method of community organization which is code for controlling people & winning elections through insidious skillful training described in Saul Alinsky's book Rules For Radicals. BO has never pursued the same type of goals as every other president but rather has consistently demonstrated without end that he is the biggest enemy the country has faced since King George III. It is the purposeful design "to fundamentally transform America" (BO's exact words) – for the worst – that the list below exposes. As you read the list below please realize that BO remains the strongest figure in politics today in that he generates not only higher positive feelings among Americans than his would-be Democrat successors but also higher positive feelings than any of his potential Republican successors – source Jerry Seib WSJ. This gives us an idea of the trouble the country is in. 1. BO made it clear, even before the 2008 election, that he was more interested in what he perceived as fairness than what he knew would produce economic growth that would result from proven economic principles – i.e., BO would rather collect less revenue & keep everyone miserable than have the economy expand with some people getting ahead. 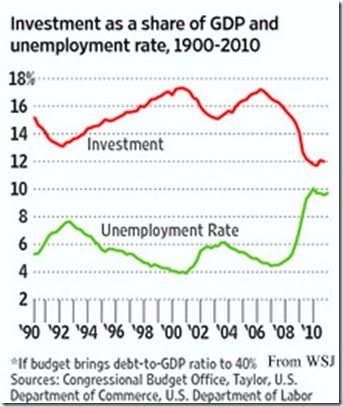 This position that pretends to favor the middle class has produced subpar growth (2% the past seven years versus 3% post WW II annual average) since the recession ended in June 2009 & therefore has cheated far too many people out of the American dream that is their heritage under every president who got out of the way of the free enterprise system. The economy & poor employment situation we are living in is BO's "new normal" & it won't be improved any time soon unless the people being affected, like millenials who keep graduating from college with tens of thousands of dollars of student loan debt, & who can't get a job in any field, let alone their field of study, recognize what a scam BO has played on them – really all of us. It has been hard to find a truly accurate measure of the jobs condition in America since BO came into office – we just know it is terrible. U-6 – still 9.9% in December - includes the total unemployed (U-3), plus all persons marginally attached to the labor force including discouraged workers who have stopped looking for work, plus the millions working part time who want full time employment. I have recommended a U-7 category. My proposed U-7 would include all of U-6 plus those employed full time who make a fraction of their former pay. U-6 & U-7 give the most complete picture of those relying on their wealth spend down to live on, whether that of friends or family, which is an excellent measure of the unhealthiness & misery of today's job market – & this unhealthiness & misery is the result of BO's intentional deceitful design. The following graph traces the investment ups with the unemployment downs & vice versa from 1990 to 2010 in perfect harmony. Solving our unemployment problem does not have to get any more complicated than unleashing capitalists to invest in productivity increasing plants & machinery. 2. BO reacts to every Islamic Fascist terrorist attack by first reminding us that the attacks have nothing to do with Islam & then explains how these attacks can be eliminated by stricter gun control & concentrating on the weather – i.e., the climate change of winter, spring, summer, & fall. BO's gun control position is intended to disarm the citizenry by eliminating the 2nd Amendment which guarantees "the right of the people to keep & bear arms." In brief, BO ultimately wants firearms our of the public's hands for the opposite reason the Founders wanted firearms in the public's hands. The Second Amendment has nothing to do with hunters, hunters' rights, or even protecting yourself in your home against an intruder like a burglar - although a gun will prove handy in such an event. It was written into the Bill of Rights so that the citizenry would have a constitutional means of protection against an oppressive government – period. The Founders were as much for the people keeping & bearing arms as they were for them to have free speech & the free exercise of religion. In fact the Founders showed their priorities by putting both freedom of speech & religion first & the right to keep & bear arms next in the Bill of Rights as a way to signal the power of the people is superior to any government. And that is what BO is trying to reverse with his gun control ploys. 3. BO has pursued his control of the economy & the citizenry under the guise of a forthcoming disastrous climate change by executive action that authorizes the Environmental Protection Agency (EPA) to write & enforce regulations on carbon emissions from America's power plants. The principles of cap & trade are @ the heart of the regulations. Click here to hear BO explain what will happen under his plans to control power plant emissions. 4. BO traded PFC Bowe Bergdahl (alleged Army deserter later promoted to sergeant while in captivity who is currently being tried by a court-martial) for five Taliban members who were released from the Guantanamo prison to the Qatari government. One private for five generals. 5. BO has pursued the closing of the Guantanamo prison – a practice started by GW Bush who freed medium or low risk prisoners from Guantanamo. According to the Office of the Director of National Intelligence 196 ex-detainees are now confirmed as, or suspected of having returned to the terror war; 122 of these recidivists are currently at-large – such figures include both Bush & BO released prisoners. And yet BO still plans to release the high risk detainees - when BO took office there were 240 detainees in Guantanamo with 180 listed as high risk according to the Joint Task Force Guantanamo (JTF- GTMO). Today only 93 detainees remain in Guantanamo of which 83 are high risk terrorists meaning BO released 97 high risk terrorists after the disastrous results of releasing lower risk terrorists. Source – Stephen Hayes (Weekly Standard) & Thomas Joscelyn (Foundation For Defense Of Democracies). 6. BO restored diplomatic relations with Cuba on July 20, 2015 with the opening of the U.S. Embassy in Havana & the Cuban Embassy in Washington. Normalizing relations with the repressive Cuban regime (who has made some 8,000 political arrests since July 20, 2015 – source Bret Stephens WSJ) will do nothing but aid the Castro brothers who will wind up with any tourist or trade money as the general Cuban population remains tyrannized. Fortunately congressional approval is required to remove the trade embargo that makes it illegal for U.S. corporations to do business with Cuba. Meanwhile Joanne Chesimard – convicted of murdering a NJ state policeman in 1973 & sentenced to life imprisonment before escaping from jail – lives in luxury in Cuba along with an estimated 70 other U.S. fugitives. Expect BO to keep pushing for full normalization with just the type of people he admires. More examples like the above list is endless but the point is plain & clear – BO is not a friend of America, he has a downright hatred for the country. Click on the referenced posts below for even more examples – if you need them. But just how far gone are we? Pollster Pat Caddell reports that 48% of Democrat Party caucus voters in Iowa favor socialism while 38% favor capitalism. It is a gigantic leap to believe that the majority of Americans could go from accepting all of the mistakes documented above, where in truth they could not be bothered with even the least degree of civic responsibility or concern for their own welfare, to a position now where suddenly they understand the stakes involved. "In no way shape or form does anyone in this room believe that Islam or the teaching of Islam has anything to do with what you've seen on the screen. It is abhorrent. It is terrible and it does not represent the religion (Islam) or any of its teachings. This is a criminal with a stolen gun who tried to kill one of our officers. It has nothing to do with being a Muslim or following the Islamic faith." 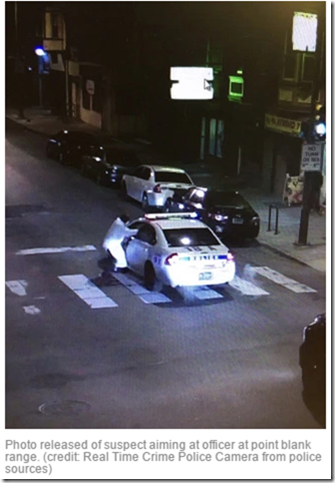 - Philadelphia Mayor Jim Kenney speaking hours after Philadelphia Police Officer Jesse Hartnett was fired @ 11 times (& hit 3 times) allegedly by Edward Archer, a convicted felon, who admitted to "acting in the name of Islam" & repeatedly confessed "I follow Allah. I pledge my allegiance to Islamic State, & that's why I did what I did (try to assassinate Officer Hartnett)" according to Homicide Captain James Clark. So who do you believe? – the mayor or the alleged assassin who also is a convicted felon. Unless Mayor Kenney spent time in a mosque or madrasas learning the Quran how does he know that the above shooting has nothing to do with Islam any more than someone who has not studied the Methodist or Presbyterian religions know the differences between them or someone who has never studied Mary Baker Eddy's writings know why Christian Scientists only believe in faith healings? Politically correct politicians, like Mayor Kenney who obviously is one, always explain that Islam is a religion of peace after the latest murder, attempted murder, or execution by beheading by people who claim Muslim affiliation. How do we know the true followers of Islam are the peaceful ones? Just because they are peaceful? This could prove to be a fool's interpretation. A thorough study of Islam, the Quran, & the Hadith is needed to know which ones are following Islam & which ones are not. We cannot rely on Mayor Kenney's politically correct statement. As for Archer – since the shooting it has been learned that people who knew him, including his mother, described him as a devout quiet Muslim, who went to mosque every Friday, & who became more combative after trips to Egypt (several months during 2012) & Saudi Arabia (a couple of weeks in October & November 2011) – source of the trip information is FBI Special Agent Eric Ruona who did not say who financed such trips – trips that had changed Archer according to a family friend. Archer, 30 years old, began expressing interest in Islam as a teenager when he devoted his life to Islam. Although "OK" @ Arabic Archer furthered his understanding of Arabic @ a local mosque – confirmed by members of the mosque. Muslim Jannah Abdulsalaam, identified as "aunty" or "sister Jannah", said that Archer was "exceptionally knowledgeable" about Islam. Based on the above information Archer is much more knowledgeable about Islam than Mayor Kenney ever intends to be. But as obvious as Archer's connection with Islam is we even have a better guide than comparing an unhinged shooter's knowledge of Islam with that of an unhinged mayor. "As Muslims, we should participate in the system to safeguard our interests and try to bring gradual change, (but) we must not forget that Allah's rules have to be established in all lands, and all our efforts should lead to that direction." - Muzammil Siddiqi, chairman of both the Fiqh Council of North America, which dispenses Islamic rulings, & the North American Islamic Trust, which owns most of the mosques in the U.S.
"Islam isn't in America to be equal to any other faith, but to become dominant. The Quran should be the highest authority in America, and Islam the only accepted religion on Earth." - Omar Ahmad, co-founder of the Council on American-Islamic Relations, the top Muslim lobby group in Washington. Last month Iowa Congressman Steve King appeared on MSNBC where King asked the host whether or not Congressman Keith Ellison, a Muslim, would put the Constitution above Sharia law. Congressman King pointed out that you can't be assimilated into the American civilization & accept Sharia law as being superior to the Constitution – it's antithetical to Americanism. The above facts & examples show the stakes involved in letting our values be used as weapons against us in the name of political correctness – & politically correct Islam is just one of such weapons focused on America's demise as a free world power. I would have thought we were beyond this years ago but it has only gotten worse. In fact those most adversely affected by Sharia law are among the strongest cheerleaders in providing excuses, without knowing what that really means for them, for what is obviously Islamic fascism intended to end our way of life – especially for homosexuals & women. I present below some of the tenets of Sharia law – they show exactly why the concept of the separation of church & state is a founding principle of America in that the governing body should "make no law respecting an establishment of religion, or prohibit(ing) the free exercise thereof" & why everyone who applies for American citizenship should prove they want to assimilate into our society – not change it. 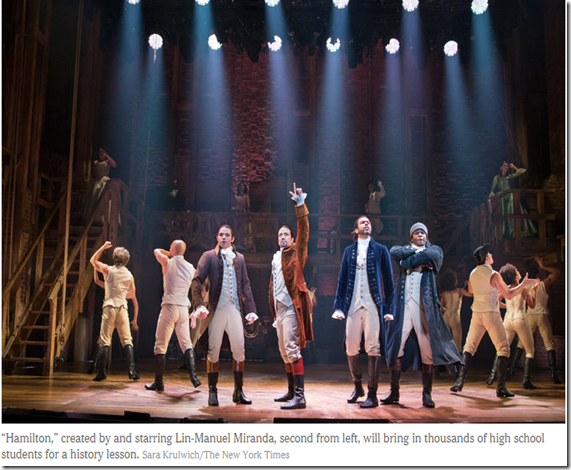 America was honored in August 2015 when Hamilton opened on Broadway after playing to capacity audiences off-Broadway. Carol & I saw the play in September & it continues to play to 102% standing room capacity audiences. I have never seen a better play – it is excellent & inspirational both as a civics & history lesson as well as a tribute that honors America – none of which is any longer taught in government K-12 schools or American colleges for that matter. 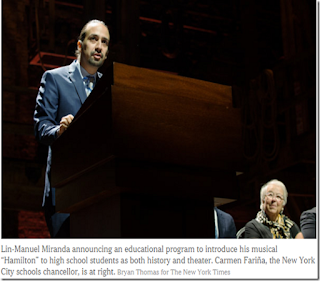 Click here to hear the writer & star Lin-Manuel Miranda sing the opening song of the play @ a special White House performance. Hamilton is sold out for about the next year – but you can get the CD online with accompanying pamphlets that includes all the lyrics. Hamilton is the other side of the 1776 coin where out forefathers in Philadelphia were determining whether or not to declare independence while George Washington, Alexander Hamilton, & James Monroe were actually fighting the war for our independence – all three of these great men crossed the Delaware River on Christmas night 1776 & fought in the crucial Battle Of Trenton. 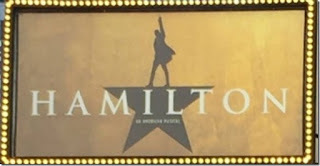 Hamilton goes on, after the Revolutionary War, to describe the struggles of America's fledgling government & of course the play ends following the duel with Aaron Burr in Weehawken, NJ on July 11, 1804 when Hamilton fires his shot in the air (see graphic above). One of the themes of the play was Hamilton's line "I am not throwin away my shot!" And of course Hamilton didn't throw away his shot in that he started with nothing except wanting to contribute to America's independence & wound up indispensably serving in America's ragtag military with George Washington that won that independence, writing the majority of the Federalist Papers after being one of our Founding Fathers who finalized the Constitution, & serving as the country's first Treasury Secretary from which position he took the country from bankruptcy to prosperity & became the architect of the U.S. financial system. 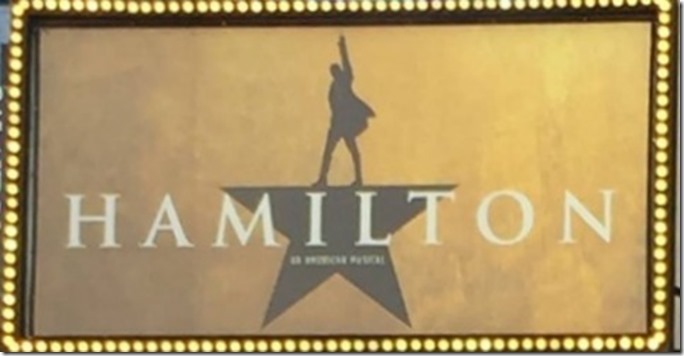 The producers have agreed to offer tickets to the play @ half price ($140 per ticket full price) for 20,000 NYC 11th grade students from schools with high percentages of students from low-income families to see Hamilton – The Rockefeller Foundation pledged to contribute $60 per ticket & each student will pay $10 (whether Hamilton is on the $10 bill on not). 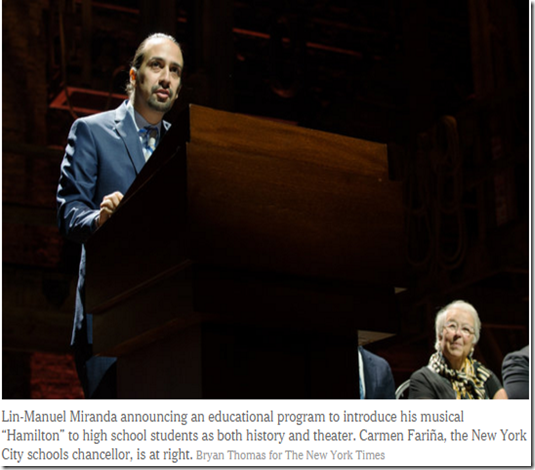 Six hundred & forty such students attended the play when it was off-Broadway & the success of the program was best summed up by a sponsor from the Theatre Development Fund who said "We had students who were in tears because they felt like they were Americans for the first time." The president of the Rockefeller Foundation said "Here's a story that talks about American history & the ideals of American democracy, & it features an immigrant who is impoverished initially & shows through perseverance & grit what he can achieve, in a vernacular that speaks to young people, written by a product of New York public education. Could there possibly be a better combination in terms of speaking to students?" And of course there couldn't be. The executive director of the Gilder Lehrman Institute Of American History said she would count the project as a success "if we've inspired a young generation to take history seriously, to get personally involved in it, and someday to serve the country as Hamilton did." So @ this time of year for making New Year's resolutions "raise a glass to freedom" & don't throw away your shot.